With success in developing intuition, your mind will enrich your life by granting you timely and helpful insights. Intuitive perceptions change lives. Talented and accomplished people know that their game changing visions came from sudden insights. They may have labored hard to achieve their success. But, they always remember that their key vision came as a sudden and unexpected gift. In the end, your insight is a gift from your mind. To become worthy of that gift, you need to develop your intuition. Nature has gifted you abundantly. Regardless of whether you work in the mail room or the board room, you carry, within you, unimaginable stores of coded DNA knowledge. Evolution assembled it, testing myriad variations. These are digital, error-correcting, and self-replicating codes. Those vast blueprints improved with each generation, across millions of years. Organisms, less suited for competition and reproduction, were eliminated and those with advantageous traits continued. Those traits are remembered by your body. At the moment of conception, the genetic information in a single fertilized human egg can only be recorded in a thousand 500 page books. In a grown human body, the total of those codes would fill the Grand Canyon fifty times over with 500 page manuals! You live and breathe supported by incomprehensibly large stores of coded knowledge. Every action you take is supported by unimaginably large and complex code. Your creative effort depends on constant acquisition of conscious and subconscious knowledge. Your intuition enables you to extract exactly the knowledge you need within the blink of an eye. But your intuition is selective in extracting knowledge. It always presents you with knowledge, which matches your current emotion. It discards all knowledge which does not fit your current emotion. In its primal need for quick responses, intuition often gives you the wrong answer. Since intuition can only give you answers from your experience, assemble as much experience as you can about your subject. Unlike the reasoning chains used by science, intuition leaps between unconnected fields with swift insights. Since intuition will offer you only those options, which you think are possible, expect your answer to be possible. Each individual has special gifts. Discover your unique area of excellence and follow that road. During the eons that it took to assemble the DNA codes, nature also assembled ascending levels of knowledge in the immune system, the spinal cord, the reticular system, the limbic system and finally, the human cortex. Complex codes save you from disease. Knowledge in the spinal cord coordinates muscle movements millisecond by millisecond to enable you to write a line, or to speak a word. Memories for myriad smells enable you to distinguish tea from coffee. Your inherited codes identify events and trigger anger and fear, or jealousy and despair. All your instinctive responses have been assembled by nature over millions of years and added to over a lifetime of experience. When you study science, or practice art, your system accumulates knowledge of millions of relationships between numerous fields. Every stroke of the brush on a canvass by a master is backed by a knowledge of the effects of line, color, perspective, texture and myriad details of the facial representation of complex emotions. A great work of art is built on inherent genius and years of practice and training. Remember that your intuition is a process, which extracts an answer from this vast lode of constantly accumulating inner knowledge. Intuition is a logical pattern recognition process, which enables you to instantly identify the coded pattern of a smell from your memories for thousands of smells. From the patterns of moving leaves and scurrying shadows, an animal identifies a predator, feels fear and takes flight. Intuition is the same routine behind each intelligent animal response. Intuition enables nerve cells to swiftly recognize, interpret and act, by extracting logical answers from massive neural memories. You do not consciously find answers to your problems. Your intuition extracts answers for you from all your experience. Emotions decide. Nature follows a clearly defined strategy to manage your life. Across history, it designed behaviors, which cope with the myriad situations, faced by living things. Each type of behavior is decided by its related emotion. The system chooses fear to make you avoid danger. It chooses anger to overcome obstacles. Once an emotion has been chosen, intuition enables the system to search its emotional file pocket for an appropriate answer. If an animal chooses to fight, it remembers actions, which won previous battles. If it chooses to run away, intuition selects the best escape route. 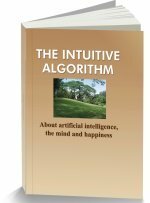 Intuition focuses your mind on all available information concerning your chosen strategy. Most people respond emotionally to a perceived problem. By selecting a single emotion as the basis for action, intuition ignores alternate strategies. If you have chosen to retreat from perceived danger, you have no access to information of previous victories, which would have helped you to stay back and fight. Emotional responses are instinctive animal responses, which deny the massive intuitive wisdom available to you. Developing intuition demands a calm mind. 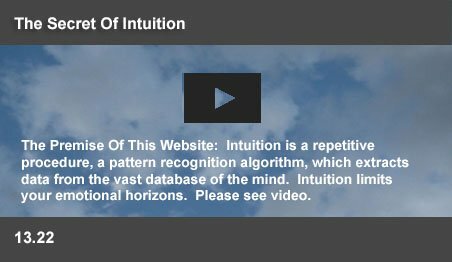 To adequately develop your intuition, follow the mind control tips in this website. They can still your emotions and enable you to calmly face your problems. The objective of intuition is a swift answer. It inhibits the rise of alternate solutions in your mind. As someone said "When a tiger bounds towards you, what should your response be? Should you file your toenails? Do a cartwheel? Sing a song? Is this the moment to run an uncountable number of randomly generated response possibilities through the decision rule?" Animals cannot afford to freeze into immobility, unable decide between chewing grass and drinking water. If the choice is to chew grass, the drive to quench thirst is instantly inhibited. In the urgency to find an answer, your intuition may choose wrong solutions. So, as far as possible, don't jump to conclusions. Sleep over your problems. Then, in a calm, relaxed state, the right answer will be gifted to you. Remember that your mind stores away relationships, never consciously imagined by you. Keep thinking of alternate possibilities. Avoid a sense of frustration, when you don't immediately find your answers. Without your conscious participation, like water seeping through a rock, your mind will be linking up distant and unimagined ideas. It could link to a memory from childhood, or an instinct from a million years past. Trust your intuition to work for you, without your conscious prodding. The lilies in the valley do not labor, or sweat. You are gifted with an incredible mind, which constantly brings you millions of right answers in your daily routines. Be patient. Science seeks to build its structures on chains of reasons. Every new theory is founded on strong experimental evidence, peer reviewed by fellow scientists. Science does not believe in guesswork. Intuition links patterns in wondrous ways. Only intuition can understand art and literature, or feel pain and anger. Intuition works with an infinity of categories and links them in myriad ways. Kick the bumper to start the car. Don't trouble yourself to find the reasons. Trust your intuition to work miracles. Intuition uses a search process to find answers within your mind. But, intuition always narrows the database to focus on an answer. If you are angry, intuition will not find friendly answers. If you believe there are no answers, your intuition will not even begin the search. So, you have to convince your mind that you can find answers. The best route to achieve this is to visualize success. Unless success is practically impossible, your mind will get used to the idea of success, if you keep imagining successful solutions. Practice positive thinking. Successful people discover their true strengths and follow those paths. Each human being is blessed with a special gift in a distinct field. Peter Drucker suggested that if you can easily do something, which others find difficult to accomplish, then you have an area of excellence. Discover your unique abilities. Listen to your faint insights. Note them down. Follow up on those ideas. In your special field, your mind will be a treasure trove, with the collected wisdom of experience and instinct, as valuable as Aladdin's cave. Believe in the immense power of your mind, with a calm expectation of success. Focus on your skills and listen to your intuition. Then, you are more likely to come up with Excalibur, the Enchanted sword. Else, your intuition will only search a tray of butter knives, devoted to anger, fear, or jealousy. Developing intuition is all about patient cool focus, without stress.